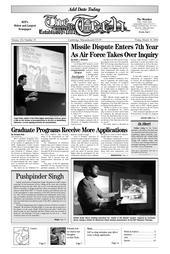 Last Friday, MIT turned to a new chapter in the seven-year-old dispute over whether Lincoln Laboratory researchers fraudulently issued a passing grade to a 1997 prototype from the military’s missile defense system. MIT’s graduate programs have seen a significant overall increase of the number of applicants for fall 2006. Applications totaled around 14,850, about 15 percent higher than the corresponding total last year, said Elizabeth S. Johnson, associate director of admissions. Johnson said it was unclear what might have caused the increase. In the past two years, the numbers had taken a dip of approximately the same magnitude, so numbers this year indicate a possible recovery. Family and friends of Pushpinder Singh ’98 gathered in MIT chapel yesterday for his memorial service, filling all the seats and crowding against the back and side walls. The service was informal and did not follow a schedule, as Singh would have liked, according to Media Lab director Frank Moss PhD ’77. Friends, mentors, and students came up to the microphone to share memories of the MIT post-doctoral associate, who will be remembered as brilliant and enthusiastic about learning, yet humble and kind. The mood swung as speakers shared funny anecdotes, and sometimes lost their composure as they described the loss of an individual who had been part of the MIT community for over a decade. The scoring errors disclosed this week on thousands of the College Board’s SAT tests were made by a company that is one of the largest players in the exploding standardized testing business, handling millions of tests each year.